Middle chapters are agonizing. The first part of a trilogy gets all the exciting set-up bits. The third part wraps it all up. And two? Poor Part Two languishes, more "The start of the end" than a proper tale in its own right. In so many words: It's not that the second chapter of pseudo-Nordic epic The Banner Saga 2 is bad, nor overly short. But with yet another cliffhanger non-ending, this second outing is less "A Sequel" and more "Another Episode"—in a story stretched, presumably, over the length of four years by the time we're done. And here I thought the releases for Dreamfall Chapters were too far apart. 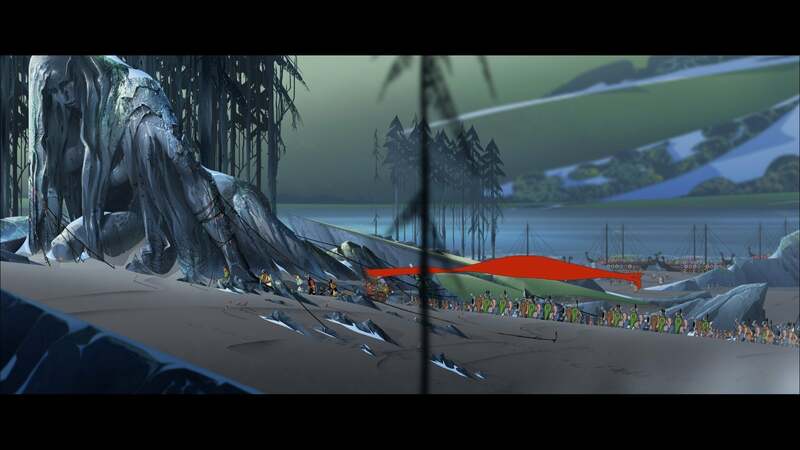 The episodic feel is bolstered by the fact not much has changed between The Banner Saga and its sequel. If you enjoyed watching your tiny caravan trudge across the landscape in lengthy camera pans the last time around? Ten more hours of that, broken up occasionally by a short chat or a turn-based battle. It's the same blend as before, though certain elements are new. You'll meet a race of centaur-folk known as the Horseborn, more distinctly a group of outsiders than even the first game's giant race of Varl. In battle, the Horseborn play the role of dart-in-dart-out shock troops, able to sprint away after attacking. Battles are also more clever than the first outing, more distinct. Most now revolve around secondary objectives—for instance, ending after a certain enemy is killed or an obstacle cleared—which minimizes the tedium of grinding down an entire horde of baddies and also allows for some interesting hold-out scenarios a la 300 Spartans versus the entire Persian army. You get a feel for the scope of these battles even though you're only playing a little six-on-six chess game. That's The Banner Saga's trick, really—making much out of little. A handful of soldiers are shorthand for an unstoppable force. A cross-section of forest stands in for a vast labyrinth of old growth. A few lines on a map and a bit of flavor text represent an entire kingdom we'll never visit. And a dialogue box stands for hundreds of deaths. 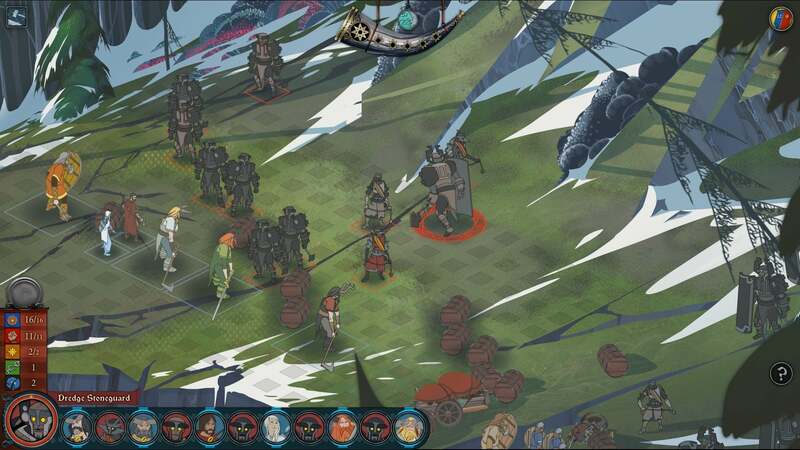 The Banner Saga 2 is still presented in the manner of a Choose Your Own Adventure. Every ten or so seconds on your slow ponderous journey to the human kingdom of Arberrang, a box will pop up with some event—maybe your guards spotted movement in the trees or you come across soldiers harassing an old woman. You typically choose between two or three courses of action and then live with the consequences. This is the bulk of The Banner Saga—making small, innocuous choices that sometimes get everyone killed. Or robbed. Or killed and then robbed. It's tough being a leader during the end of the world. The problem is these choices once again feel largely inconsequential. Most of the game revolves around provisioning your caravan and keeping your followers alive, but not only is it fairly simple but there's really very little reason to bother aside from forced sentimentality. Sometimes the number of humans in your caravan goes up. Sometimes it goes down. Either way, you're unlikely to notice a difference. Named characters suffer from the same problem as in the first game—there are too damned many of them. And once again, the game has time for about five of them to have any meaningful impact on the story. The rest hover in the background, occasionally butting in to give roundabout "Oh captain, my captain" speeches or remind you "Ah yes, you're the red-cloaked archer lady with kids or whatever who I haven't heard from for the last ten hours." And it's the crew from the original game that suffers most. Not long into The Banner Saga 2 our neatly-unified group splinters into two caravans again, and it's the new one—The Ravens, led by the legendary Varl berserker Bolverk—that carries most of the important story beats here. Which is great because Bolverk is a badass, but less great because all of the important characters from the original Banner Saga are in the other caravan which does...well, nothing really. Not much of anything, for the whole game. Herein we return to The Banner Saga 2's biggest flaw: It's the middle part of a trilogy. And a trilogy structured in the most unsatisfying way possible—not three related-but-separate stories, but one lengthy tale chopped into three pieces. Frodo walks a little closer to Mordor. Master Chief tells us he'll finish the fight, next time around. Neo does...whatever the hell happened in The Matrix Reloaded. 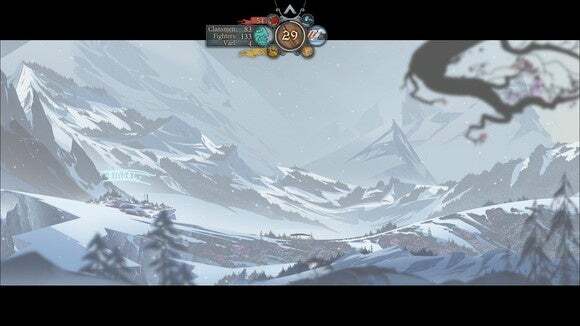 Thus The Banner Saga 2 picks up from one cliffhanger and drops us off at another, and—just like the first game—it cuts to credits right when the story starts to pick up. There's the [big spoiler moment] and then you get ready for the revelations to follow and...nothing. Join us again for The Banner Saga 3. As I said up top: It's not that The Banner Saga 2 is bad. Same great art, same tense tactical battles, same bewildering sense of scope emanating from such delicate pieces. 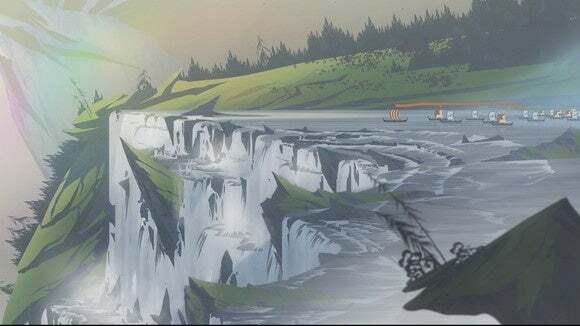 I never knew slow pans across landscape paintings could instill such awe, and yet certain sequences in The Banner Saga 2 support tension that belies the game's humble budget. But there's not much substance here, and certainly not enough for this game to stand on its own as a work of fiction. It's an episode, presented as not-an-episode. 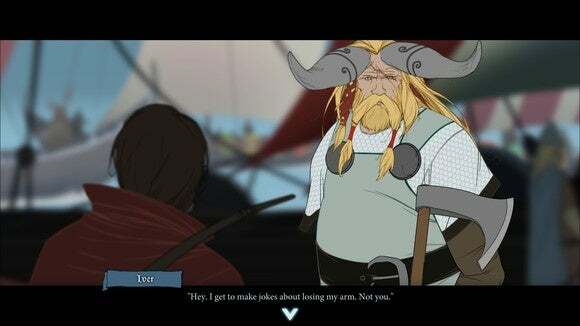 Judged on its own merits—not the plot lines it wraps up from the first game and not those it sets up for the last— The Banner Saga 2 is underwhelming. I'm looking forward to the third game, assuming we get answers and it's not a barely-concealed feint to set up a second trilogy. But a handful of great moments don't save The Banner Saga 2 from feeling like a largely ancillary tale. The Banner Saga 2 picks us up at one cliffhanger and drops us off at another.